A longer life span is not a fountain of youth. As future generations routinely join the ranks of the centenarians, America must retool its youth-oriented culture into something more elder-friendly than it is now. This timely two-part series addresses the multifaceted issue of maintaining a good quality of life over the long haul, as the senior-set becomes the dominant demographic segment in a nation where a premium is still placed on being young. 2-part series, 29 minutes each. While technology and economic factors have a great impact, social customs and values can be equally as important in caring for the elderly. This five-part series begins with an assessment of global demographics, focusing on the incredible rise of elderly populations worldwide, and then looks at the welfare of senior citizens in Tunisia, Japan, Nigeria, and India. A United Nations Production. 5-part series, 9-16 minutes each. In this acclaimed four-part series, veteran PBS journalist Bill Moyers reports on the growing movement in America to improve care for people who are dying. Using interviews and research from across the country, each program describes the intimate experiences of patients, families, and caregivers as they struggle to infuse life's ultimate rite of passage with compassion and comfort. The DVD version of this series also includes a special video introduction by Mr. Moyers. This powerful series is available exclusively through Films for the Humanities & Sciences. 4-part series, 87 minutes each. This provocative four-part series, hosted by NewsHour's Ray Suarez, invites viewers to look at death with their eyes open to the end, so that they may more fully live in the natural light of the inevitability of dying. 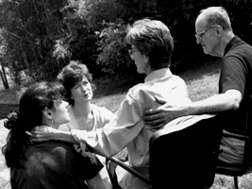 Topics such as grief, medical decision making, caregiving, and life after death are discussed in intimate groups. Simple exercises to assist in the healing process are included. 4-part series, 26 minutes each. Created to meet the needs of a steadily growing American senior population, this series addresses important issues that affect quality of life for older men and women, as well as their spouses, family, and friends. Through scenes of daily living, interviews, and expert commentary, the programs provide valuable insights and advice on mental wellness, the key to successful aging. 3-part series, 55 minutes each. The death of a child is often the most difficult of all deaths to accept. This series explores how families cope with the death of children and young people, each program focusing on a different kind of death and offering the experiences of family, friends, and support professionals with this almost taboo subject. 7-part series.